I love the Chatham Community Library. 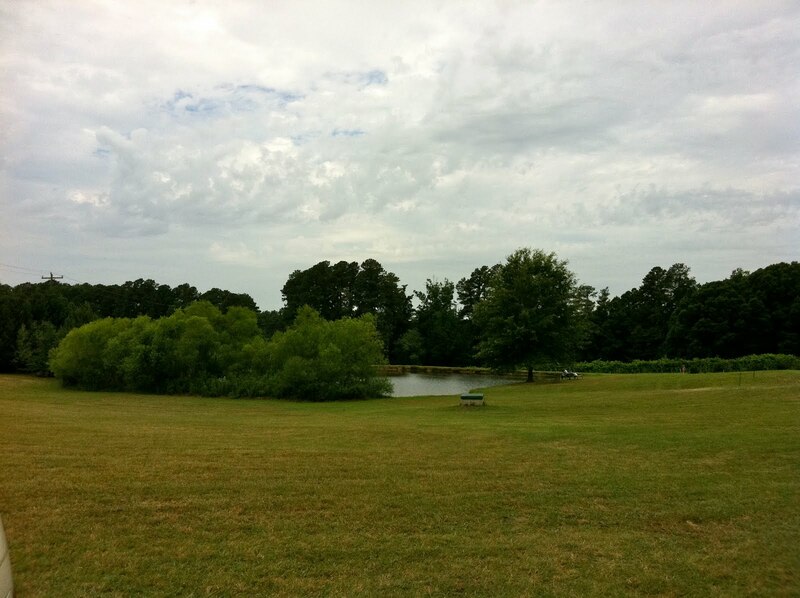 New and sparkling and beautiful, it is such a wonderful place in Pittsboro. The kids' room itself is like a dream: beautiful murals on the walls and colored sparkling lights dangling from the ceilings. I love being in here so was pleased to take C to storytime here. Storytimes are, at time of this publication, held on Tuesday and Friday mornings. These are rarely crowded, although there are other kids here to enjoy, too. The woman reading was good. She wasn't sugary sweet and didn't talk down to the kids, but was certainly patient. She let them run around and mimic the books when it seemed appropriate but also asked them to sit and listen quietly when necessary. She did a great job animating the books and making the kids connect to the stories. The ages here are more for the 2 - 5 year olds but there were older and younger kids also enjoying themselves. Since this storytime is in its own room, it's ok if things get a little loud. Just try to reel your kid back in once they leave the kids room (best of luck, and if you have any tips on how let me know!). Other things you can hit in this area? 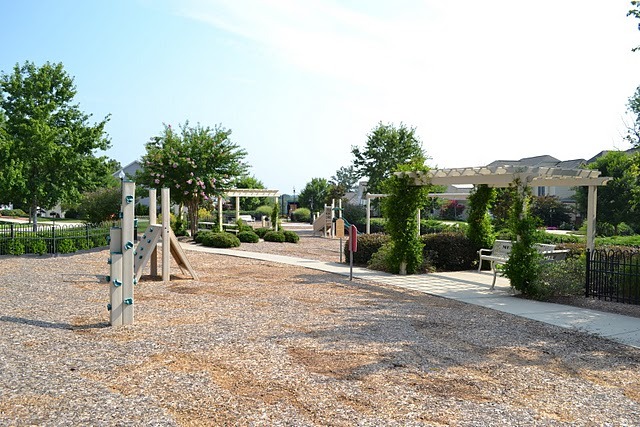 If it's nice, we love Pittsboro Kiwanis Playground for toddlers. Grab an early lunch at General Store Cafe followed by some milkshakes at S&T's Soda Shoppe. And perhaps even do some shopping at the Pittsboro Toys. Plus, most likely on your drive, you will pass that Dog Wash/Car Wash/Espresso Bar/Ice Cream Shop place! It still cracks me up. Lucky for me this pregnancy and last were so healthy and easy and normal that I have had very little medical intervention. Which means not a lot of time at doctor's offices (hooray!) but also only one little ultrasound. Which for someone who loves to see the baby was pretty sad to me. I know, irrational, but I blame it on crazy pregnancy hormones. So I decided to check out one of these boutiques that does 3D (and now 4D) ultrasounds. I never had a 3D ultrasound with C and wasn't offered one at the doctor's office for BB2 ("Baby Boy 2"). For some reason (pregnancy hormones again?) I wanted to try it out. I was torn between trying out Triangle Imaging or Prenatal Peek. Their services and prices were really similar. Ultimately, it came down to location. Prenatal Peek was closer to me; Triangle Imaging is in Cary. Speaking of prices, there are a variety of packages but these aren't cheap. Nor are any of these covered by insurance. These are elective noninvasive procedures. But they are still run by professionals. Both Triangle Imaging and Prenatal Peek seem to offer a lot of specials, though, so get them while they are hot. You can go in for under $100 and come out with cute pictures (all put on a CD-ROM for you) and some video, too. I thought the session time would be short and leave me feeling short-changed at only 15 minutes. But, truly, that was adequate and fulfilling. Plus you get, in the words of Michael Scott, some serious S.W.A.G: Stuff We All Get. Books, magazines, totes, formula, La Leche League information, and who knows what else I stowed away for BB2's arrival. Additionally, these ultrasounds are not for medical reasons. Which means that while your doctor will run an ultrasound clicking and measuring and weighing, these imaging boutiques just let you look at your baby, hear the heartbeat, and take home a lot of cute pictures. If they believe anything looks amiss they send you back to your primary care physician. The experience here is much different than your doctor's office experience. Here they play soothing lullabye music and everything was so comfortable with couches and chairs and loungers all around. Plus you could hold court in the ultrasound room. Seriously. I counted and outside of mama and the technician you could have 5 people sit elsewhere in the room very comfortably. They can all look and oooh and aaaah over your baby moving around. And it really is a remarkable experience. Pregnancy seems so surreal at times, since your body is taking over and doing what it needs to do. It is a magical experience to be able to peek inside for a little while and see the baby. Makes me excited to hold him when he gets here! 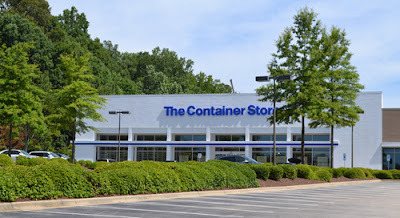 The Container Store is a newer arrival to our area. I won't lie, I was thrilled when they finally opened so I could go into one versus ordering online. (Now if we could just get Ikea in the Triangle too! Oh wait, I'd be broke...) Funny thing is, now that the store is open in Raleigh, I still find myself doing most of my shopping online! The store itself is gorgeous. Bright, airy. So well organized - of course. I could wander for hours looking. D has been very patient with me in the past. And even loves to try out the children's furniture (there is a cute art table with a photo of crayons on it the poor child tries to pick up every time!). But there are times when it just isn't convenient. This is where their website and "Click & Pickup" program are my best friend. I visit the website. Find the item(s) I want. See if they are currently in stock. Place my order and arrange my pickup. This speeds up my shopping trip as everything is already bagged when I arrive. It save my wallet too as I can see the total add up on my screen and know exactly what I'm spending before I get to the register. Plus, helps ensure the container I want literally fits the items/space as I can check measurements online & at home versus just guessing in the store. When you make a Click & Pickup order, there are two designated parking spots directly next to the front door reserved for you. Park here and head in. The customer service area is immediately inside with signage noting the Click & Pickup pickup area. If you are in a rush, I suggest calling before you arrive to request your order is brought to the front. Otherwise, they will have to go to the back to retrieve. It's not a terribly long time, but your checkout will be faster if you call ahead. 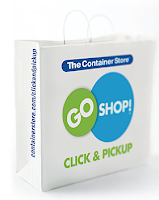 Or - a parent's best friend - use their Curbside Pickup and have it brought to your car. 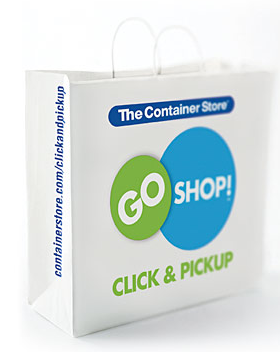 Call the store about 15 minutes prior to your arrival, park in one of the designated spaces, call the store again to say you have arrived and have your order brought to your car. As I now watch my infant niece plus D during the week, this carryout service was a huge help to me recently versus having to unload two small children from carseats, get them inside, etc. Instead, after playtime at a local park where I made my call-ahead, I pulled up, called and we kept singing away to Laurie Berkner while waiting for my order. We were back on the road and headed home just in time for lunch & naps. Perfect. This weekend I was solo with my son. And, as a SAHM, I was anxious to get some help and some adult time for the weekend. You know, anyone to keep me from going crazy and help me out. I have found this works out so much better when the other adult is trapped with me overnight so that they can't escape. Thus I took C to Charlotte to visit his Uncle (surprise!). I love Charlotte, and we have already talked to you about the awesomeness that is IKEA. Yet this trip to Charlotte found us taking C to Discovery Place. Discovery Place is smack downtown, not to be confused with Discovery Place KIDS which is in Huntersville (a 20 min drive from downtown Charlotte but supposedly still great...next trip). We weren't really sure what we were getting, but we knew it was convenient. We were worried about what ages this catered to, but loved the location. Our time here was great, and totally worth our foray into the unknown(ish). The admission price here isn't cheap. It was $10 for kids over 2 and $12 for adults. If you want to do IMAX (which is available) that is extra, of course. So you will have to fork out some cash. And you might feel like you were ripped off when you then look at the map and see that it looks tiny. But don't be, there is a lot here. We headed immediately for the KidScience area, for kids 7 & under. This reminded me some of Marbles, yet it was all contained in a tiny area. There was an enclosed place for crawlers and wee ones. There was a water table, light board, crafts (overseen by staff), instruments, puzzles, dress-up, and who knows what else that we missed. This was great! It was definitely more learning-centric than Marbles or Greensboro Childrens Museum. There were signs around explaining, demonstrating, and hypothesizing. Of course, most kids in this area don't care and don't read. After some time there, we headed out to the rest of the museum. We went into a little rainforest area. Downstairs you look through glass (they have shows in here) and upstairs you are on a bridge....and you can go over a rope bridge....exciting stuff! We passed a python held by a museum worker that I and Uncle Dan had to touch but C wouldn't come near. W e personally skipped over the wild nature center as these were microscopes and exhibits for older kids. Instead we made our way to the fish aquariums in the back. It's the little things that make a place great: like the benches that they had placed under every display window in the aquarium portion so that little tykes could stand and see. All that was just the first floor! On the second floor there were electronic and electricity booths; there was a rotating exhibit section; there was a section that I didn't get that was called "Think It Up" where kids make their own footwear, play with stop motion animation, experiment with air tubes, make stuff out of foil, and run through holograms; there was an area to walk through looking at microbes (ew); there were hands-on things for older kids such as pulleys and slingshots. I mean, a lot. There were also little hidden surprises along the way (check out the light up sticks on the second floor). We didn't try out the shows at either the IMAX or the 3D theatre. With our 2 hours our little guy was amused enough by exhibits. But you can spend all day here. We got there right when the place opened on a super hot Saturday morning (10 am). And while we were never crowded out of any place it felt like the place was filling up quick. I can imagine that summer weekend afternoons could be packed. There is a parking garage on site for the museum. You can also try your luck parking downtown. If these pictures here weren't enough to tickle your fancy, and/or you are a visual person, and/or you are bored and really would like something to click on, you can check out more pictures online of the place at our photobucket site here. There is a cafe on site, but we didn't evaluate the prices. Instead we ended up walking 2 blocks to a Brixx. Yes, the same chain that we love here in Chapel Hill. We assumed it would be kid friendly (it was; lots of families), it was open (we ate early), and it was super close. They even gave us the same dough ball to play with. Bathrooms at Discovery Place are gorgeous with changing pads. Everything is stroller friendly....really, all the things you can think up for a good kids museum. What I personally liked about this was that it seemed to work well for all ages and felt like there were opportunities to learn. Some of these kids "museums" are simply imaginative play stations (which I love, no criticism) but Discovery Place actually had a lot of learning and science in it for the older ones. FYI, there is a cute little park 1 block over on the corner of Trade & Tryon that is at a church but open to the public. If you want to get some outdoor (free) playtime in combined with this visit, I recommend it. FroYo is taking over the world. There is the new Sweet Frog at Southpoint (coming soon to this blog, but yum! ), another new FroYo place going in by the Target at Southpoint, and now this new location near Governors Village. I hope ice cream isn't extinct. Has anyone had a sighting lately? So how to judge these places? They all seem to have the same trendy-bright-pop interior, with chairs that aren't entirely comfortable but look really cool and repel frozen yogurt well. They all have the machines on the wall where you pick your flavor. They have a variety of toppings you can pick, and then you pay by weight. I don't believe that this organic moniker applies to the toppings, though. I, personally, have yet to find organic Reese's Peanut Butter Cups (believe me, once I do I will be all over it as a way to justify my sweet tooth). At Igloo, this is a smaller shop. The selections of both flavors of yogurt and toppings aren't as diverse as Tutti Frutti or YoPop. However, it sits in a location where not much else like this is available, it is still clean and, of course, trendy-pop inside. If you want to get the kids some FroYo, you can then swing by the drive thru of Bean & Barrel on the way home and treat yourself to a blended coffee drink. So not organic or low fat or low cal but WORTH IT! 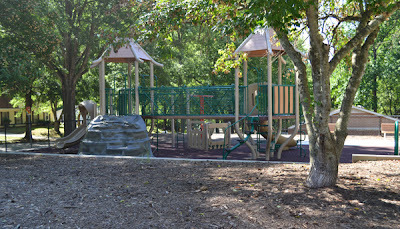 D and I ventured out recently to explore one of the newest playgrounds in Raleigh. This particular playground, Longstreet Drive, is located in a neighborhood in North Raleigh and just opened this year. We had a fantastic time running around, digging in the sand box and sliding. There are two main pieces of equipment - one for the 2-5 age range and one for the 5-12 age range. The latter and two swings (one bucket, one regular) are well shaded by large trees. Next to the smaller equipment is the sandbox, a teeter totter and one spinning seat thing (first I've seen - picture an office chair minus back so you sit & spin). Those, unfortunately, were full sun during our morning visit, but not unbearably hot minus a couple of the small slides. D was a happy boy spending most of his time digging in the sunny sandbox. I did manage to talk him into exploring the larger piece of equipment. It was pretty easily scaled by my 2 year old via steps and the "rock" wall. The slide there was larger, naturally, but also nice and cool unlike some of the smaller ones. interactive spots for all ages - a steering wheel and a little stage panel. I laughed when I saw the stage panel - remind anyone else of Mystery Science Theater 3000 with those little head silhouettes down there? 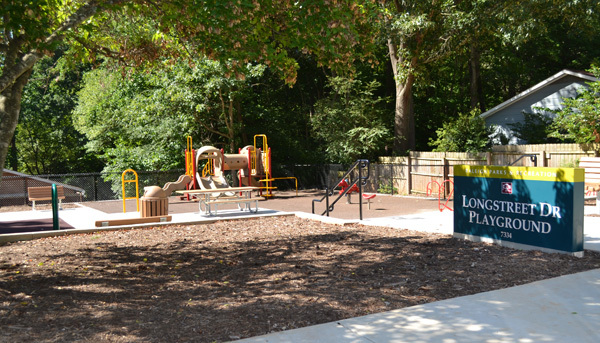 The playground is located on the corner of Longstreet & Stuart Drives. There are two entrances - one via steps coming from Stuart and one at ground level near the corner intersection. The remaining side against Longstreet (busier of the two streets) does have a fence, but note neither entrance is gated. The fence continues around the back and opposite side while the front section facing Stuart is a block retaining wall plus the steps. Thus, children are pretty well contained, but do be watchful. There are no restroom facilities or water fountains. Parking is along the street. There are picnic tables (one in a shady spot near the road) if you want to pack a lunch. The main ground cover is rubber surface minus the sand area & concrete sidewalks which includes a built-in hopscotch so bring some sidewalk chalk! If you feel up for a walk, head a couple blocks southeast on Longstreet Drive to the intersection with Bent Creek Drive. There is a greenway access point there. This past spring, if you follow us on Twitter, you heard a little bit about the writing class I took at UNC's Friday Center (yeah, totally paid off, no? can't you tell how totally awesome and, like, great, my writing is now). Ok, in all seriousness, I loved this class. And since many of you have asked about it, and since registration for Fall 2011 is up, I wanted to clue you in to this neat little community initiative the Friday Center is offering. This is their Community Classroom Series. This is not for credit, you don't need to be enrolled in any special program, and you don't get certificates or credentials out of it. These classes are really just to keep your mind sharp, challenge you, and encourage you to explore new topics. The classes offered are a huge variety. I took travel writing but this fall the classes are things such as "The Art of Food Writing," "Digital Photography," Retirement Planning," "Authentic Happiness," and "Money Smarts for Women." There are many more, check out the link below to see all. The classes are geared towards people who work or otherwise have lives outside of a classroom. So expect many of them to be offered evenings or weekends. And usually they are only a 5-7 week series. Also, don't expect homework. In the class I took, which was writing afterall, I expected to go home and have to write droves for review and sharing in the next class. Not so feasible with a 2 year old in the house and a baby in the belly. But that wasn't the case. We had a few little projects we were welcome to do in our spare time if we wanted additional help and critique, but no pressure. All class sizes are restricted in number and fill up very fast. Most of the classes are fairly small in size, too, so you get to really rub elbows with the instructors (who are usually very prominent and influential folks in our area) and other students who share your interests (also called networking). We've been making the sprayground circuit lately. I love them (quite possibly more than C). Which is weird considering as a kid I never got into water parks, slip n slides, or anything of the sort. I preferred to be in an actual pool, my legs tied together, pretending I was a mermaid. Note that singing underwater is way hard. Anyhow, I was excited to try out the final sprayground in Durham: East End. First, let me talk about the playground. The playground structure itself wasn't bad. This is a small park off of Alston Ave, but the playground still held some entertainment for our toddlers. Ground cover was mulch, not a lot of shade, yet we were there early morning when we had a nice breeze (unlike our Meadowmont Day!). Despite the relatively nice condition of the play structure itself, us moms were none the pleased to discover not 1, but 2, prophylactics underneath the playground. Used, too. Now I don't care what crazy things people or teenagers do - provided they aren't related to me. But clean up folks. Gross. There was a nice picnic shelter with some toddler-level tactile toys and nice picnic benches. Our kids also enjoyed the old, grown-over little amphitheater here. It was small but fun. And then there is the sprayground. I will go ahead and put this post under our sprayground listing since Durham claims it as such. But I am hesitant to do so. You be the judge. Here is the sprayground: It didn't even work when we were there. Also note that the bathrooms and Recreation Center were all locked when we were there at 10 am. So my advice, parents, is that, unless you are at LocoPops and really want to head to a park, this might not be the best bet. Forest Hills is down the street and we had a very good time at that park and sprayground last year. I know, hardly seems like playground weather these days. But Sarah C. and I needed to mix it up a little. So early in the morning we met in Meadowmont Village to get coffee (iced, of course) and bagels from Carolina Cafe then took off to hit a playground in Meadowmont community and let the boys run around. 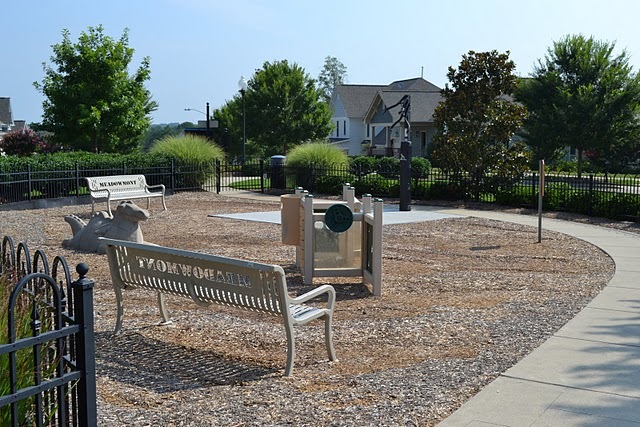 We've already talked about the Meadowmont trails on this blog as well as some of our favorite things about the Village such as Brixx, Firehouse Subs, Lickity Split, the Wellness Center, and the YMCA outdoor pool (which has a playground area). But there is also a really great playground just plop in the middle of the street. Well, ok, it's not like that. It is actually quite lovely and safe. We spent some time at this little playground off Parkridge Ave (this is a very easy walk from the Village Center - head left on Sprunt, right on Weaver Mine Trail, right on Parkridge). This playground doesn't have a lot of shade, yet. There are some arbors which will fill in nicely in the next year or so. In the meantime, you can still enjoy this as there is a toddler area as well as a climbing area for older kids. And the whole thing is fenced in. 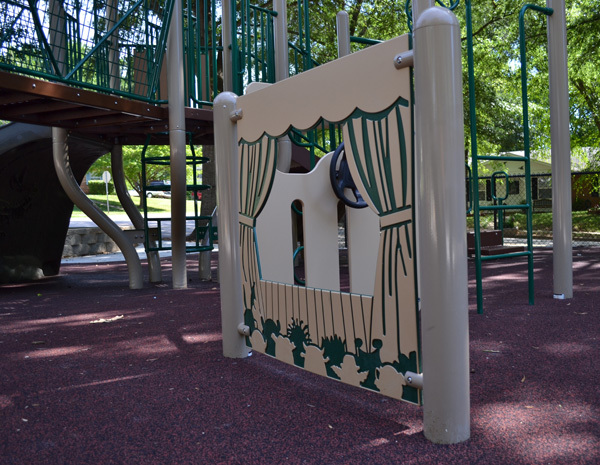 Although this particular spot isn't big on playground equipment (1 slide, 2 bucket swings, 2 regular swings, 1 climbing station for older kids, and 1 climbing area for toddlers), it has a few little surprises. Our boys enjoyed the concrete dinosaur. And there is a little basketball spot (alas, no net or hoop yet). And we noticed a hopscotch board etched into concrete. So bring sidewalk chalk! 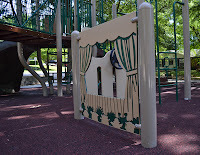 There is another playground in Meadowmont, in The Apartments, that is not nearly as big on space but still fun. You can access this from Barbee Chapel via steps right across from the big lake at The Cedars. Again, not much shade here but it wasn't as blazes hot here as the Parkridge playground. By the way, that lake is quite pretty with a community garden on its banks. Worth a nice little stroll. You know, when the humidity isn't 250%. I have a new-found love and appreciation for good, prepared food. Being a full time mom to a 2 year old with another "bun in the oven" (I found a food metaphor appropriate here), it gets really hard to stay inspired to cook healthy, delightful tasting meals every night. And it just so happens that Fresh Market is on my way home from one of the gyms I teach at. Hooray for insta-dinner - that isn't Stouffer's French Bread Pizza! If you haven't been to Fresh Market before, it is an upscale grocery store. I consider it one step up from Trader Joe's but not quite a Whole Foods (I know, this echelon of grocery stores can get quite confusing). There are a lot of goods here: fresh fruits and vegetables, fresh breads, canned goods, frozen entrees, bulk items, butcher's counter, fish counter, and other things that make this a grocery store. But it isn't huge, so I wouldn't plan to do all my grocery shopping for the week here. It's a nice place to stop to pick up something if you need for ingredients quickly or want high quality meats. Or, like I mentioned, to pick up a prepared meal. In the middle is a counter full of all sorts of meals and ready made entrees: roasted chickens, vegetable and pasta salads, pizzas, and other sides and main entrees for the plucking. We have enjoyed the prepared foods we have picked up here. Other favorite spots of mine in this shop: the coffee spot (smells so good) and the "chocolate delights" jars! Also, their floral section makes me feel pretty. Update: Chick-fil-A at Northgate is closed. Still plenty of places to "Ear More Chicken" in the Triangle, though. This past Thursday my mommy's group and I went in search of something that doesn't exist over at Northgate Mall. No, it wasn't a cream that removes stretch marks or the secret to how to sleep in after kids. It was A Sea of Learning's storytime. Well, it doesn't exist since A Sea of Learning is closed (boo). However, if we didn't already love Chick-fil-A for awesome things like play areas, sticky table mats with kids meals, 3&under books, and Mom Valet, we love them even more now they have taken over this Thursday morning storytime. And they did a great job! The storytime itself was short: two books geared more towards tots and toddlers. They held our kids' interest. Then we all sang some wildly toddler-popular songs like Itsy-Bitsy Spider & A-B-Cs. This storytime also comes with a craft. The craft the day we went was a make-your-own cow tshirt. And Chick-fil-A provided everything we needed, even the tshirts (of various sizes) and plastic bags to take wet tshirts home in. Chick-fil-A offered some refreshments, such as drinks, but since it starts at 10 am we didn't need too much. Despite this being at a mall restaurant few kids went running out of the storefront and into the mall. This was primarily due to the way the place was set up, with a kid-friendly rug for the stories (that our wee ones loved jumping on) and then a ring of chairs all around the outside for parents to sit and be gate keepers. This storytime/craft time is completely free. No website for us to send you to but the manager of the store was there when we were and said that they are planning on doing this storytime every Thursday morning at 10 am and just to show up. If you are looking for a way to entertain your kids inside, I suggest this hot spot! If you want, skip breakfast and splurge on some Chick-fil-A for mom and dad. Today's post is a special little, and different, piece from our guest blogger Rachel (find out more about Rachel and where to find her regularly below). This article gives you an inside, humorous, and useful look at how to maximize your time and efficiency at consignment sales. Which is great, since consignment season is coming. See, I have a toddler and he needs clothes, like, every day. Ridiculous. And because I like to spend most of my extra cash on stuff like nail polish and Lauren Conrad tops, it’s important I maximize my consumer savvy to keep up with the kid’s wardrobe while not sacrificing my taste in the latest trends. I’m half-way kidding. Ish. But also! I want my toddler to look like a Jolie-Pitt. That part is important. Enter, consignment sales. If you hit the right sale at the right time, you can bank really high quality, name brand children’s items for less than the cost of that macchiato you drank on the way there. Many items still have tags. Win. And if you’re super into it, you can even make money by selling items, but that’s a whole different post altogether. Today we’re going to talk about consignment sale preparedness. SCHOOL IS IN SESSION. Now, my first trip to a consignment sale was outrageous and I almost died of fatigue, anxiety, dehydration, and mauling. I wasn’t prepared at all and you can read about that here. But I survived, albeit a smidge traumatized, and now I’m here to share with you tips for a successful consignment sale experience. A ten step program, if you will! Whatever. Let’s get started. 1. Mark your calendar. Impromptu consignment shopping is not recommended for various reasons including but not limited to sanity. Plus you’ll need time for (2). 2. Fitness. P90X is the official recommended exercise for those training for a consignment sale because it builds stamina, which is arguably the most important tool in a successful consignment sale experience. (Also a good tool? Scrappiness. Be competitive about it.) But the bonus benefit of P90X is that it makes you hate life, thereby when you’re in the throws of the sale and you want to quit, you’ll remind yourself at least I’m not doing P90X. Feel me? 3. Make a list. What does your child need in his or her wardrobe? Are there any specific toys you might look for? If you’re familiar with the layout of the sale, draw a map to ensure utmost time management. 4. Pack snacks. Something like an apple or peanut butter crackers is good. Why? Because your mom said so. And my personal favorite: Diet Coke. Or if you’re a fancy health person, water. 5. Use the restroom beforehand. It is extremely difficult, if not impossible, to use the restroom while consignment shopping. I strongly advice against trying. 6. Take a buddy, if possible. It is important not to disclose the activity (consignment shopping) beforehand, so as not to frighten your buddy. Say something like, “Let’s get together for a walk,” (casual attire, see how that works?) and offer to pick your buddy up from his or her place of residence. This is crucial because he or she will therefore not have a getaway vehicle. Once at the sale, confuse your buddy with a “SURPRISE!” If a Real Housewives fit ensues, pay them. 7. And if you have a buddy, use whistles. This tactic was best illustrated in Season 7 of Friends when Monica shopped for the cheap wedding dress. Basically, if you or your buddy winds up in a brawl over merchandise, the whistle may be blown to cue a rescue operation. Basic science. 8. Take a shopping cart. Because no amount of working out will prepare you to carry 100 lbs of children’s clothing on each arm. Been there. 9. Wear intimidating clothing. Think glitter, sequins, bed head. Bonus points if you have a hat similar to the one Princess Beatrice wore to the royal wedding. 10. Strategize. Once inside the sale, collect any and all items of interest. Claim them. Once you feel comfortable you’ve collected all David Beckham look-alike baby boy clothing- or whatever floats your boat- sort your items as necessary. You must do this in a well lit area so you can identify stains. Now you’re reasonably prepared for your next consignment sale, my friends. Class adjourned. I mean, dismissed. Wow, too much CA trial coverage YOU THINK? The Kids Exchange Consignment Sale in Raleigh is coming up July 11th through the 18th, followed closely by my personal favorite, Upscale Resale in Cary, August 11th through the 13th. There are many awesome sales here in the Triangle- many taking place late summer (winter clothing)- so go get your Google on and have fun! Rachel Rankin resides in Cary with her husband, toddler, and two herding dogs. She graduated from NCSU and loves the Canes! You can find her daily on her humor blog, UpperBottom.com , where she overshares about motherhood, marriage, and pop culture. Not all summer days can be perfect pool days, unfortunately. That's why it is nice to have indoor options. We, of course, review indoor playgyms here at MiCHill. But this past week I had the occasion to take C to a kids movie at The Lumina Theatre in Southern Village. This isn't just your standard pay lots of money, fight crowds, blockbuster kids movie though, like Cars 2. This is a discounted showing of a slightly older movie, screened in the morning, specifically for kids. And it is great. This was C's first movie and, honestly, the actual movie itself was a lot less important to him than was the experience. Plus since he is in that batch of kids that has a hard time sitting still through a whole movie, I didn't mind leaving early since we had paid so little (Although what happens to Marmaduke and Phil? Does Marmaduke get Jezebel, does Phil get the marketing campaign set? Cliffhangers!). So how little is a little? Well, admittance is $2 per child. Adults are free if they are with kids. Then they offer a kids popcorn special: 1 small box of popcorn with a small soda for $1. Yeah, you read that right: $3 for 1 child for the entire experience. You can get a season pass for $8. Doors open at 9:30 am, movie starts promptly at 10:00 am. Although here's my tip for you: I am pretty controlling about what C is allowed to watch. And although the movie starts at 10 am that includes the credits. Obviously you can't control credits and for some reason one of the previews was for The Last Airbender, pretty intense. You might want to plan to enter while previews are rolling to kind of skip those if that matters to you. Of course, if you are later you may have seat issues. But I think a lot of the crowd size depends on outside weather (of course). And even though it was a dreary, rainy day when we went with a reasonable crowd, there were still plenty of seats available. Because this is a kids series there were lots of hoots, hollers, chatterers, and noises going on. Which I appreciate since sometimes keeping C quiet can be a challenge! This is a smaller theatre so you won't find the sort of arcade alley as at some of the other movie theatres in the area, but there are a few coin-operated games around that were also a hit with the kids. All of the movies shown are rated PG and the list for the summer can be found at their website (below). So check the reviews and IMDB before committing if you want. The series runs end of June to early August, and screenings are Tuesday and Wednesday mornings. Feeling like summer is turning your kids' brains to mush? (Lucky you if yours are on a year-round system.) I remember how my parents used to make me and my siblings do Scholastic readers and other educational workbooks during the summers to keep us 'sharp.' Ah, memories. And my mom would love this store in University Mall. Katie Beth's Learning Garden is full of educational workbooks, reading books, educational toys, and crafts to keep little minds engaged. Although this shop has no official affiliation with Waldorf or Montessori, you will find a lot of toys related to both programs here (which is good, since I miss the Waldorf shop that used to be). For craft materials there are boxed art projects but you can also get block crayons, rock crayons (love these), papers by the sheet, fleece materials, and more. There are materials here for all ages. C was particularly enamored with the dinosaur workbooks, stickers, tattoos, coloring books, and readers. Prices vary since goods are both new and previously used. The owner of the shop is a homeschooler mom of her brood so she is very knowledgeable about the educational materials. Head on in: summer doesn't have to be an educational wash anymore! 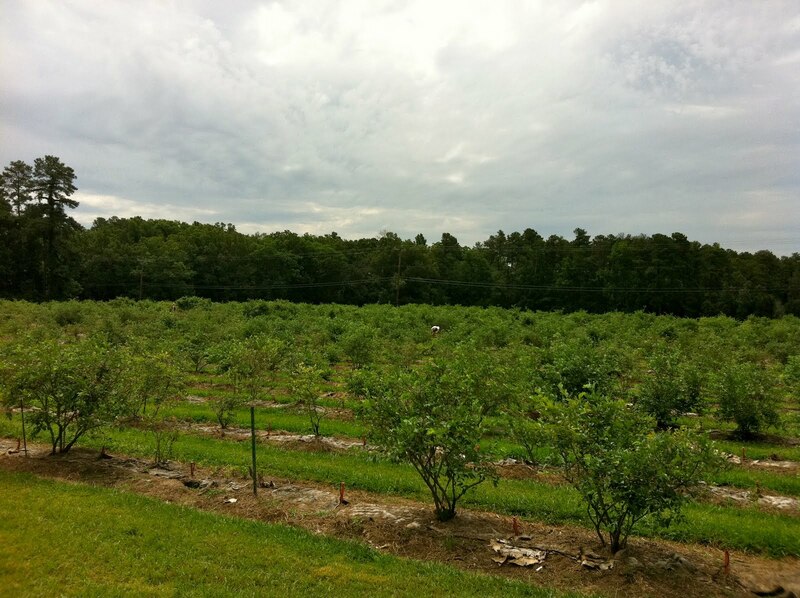 With its picturesque scenery, ripe delicious fruit and convenient location, Herndon Hills Farm is the perfect place to spend a morning. And of course, picking is a great way to teach your kids about their food and healthy eating. I encouraged my son (age 2) to pick in his own small bucket while I kept the majority of our berries safe from being dumped. These little flavor gems take a while to pick so try and go early before the sun beats down. The farm provides buckets lined with a plastic bag so you can take your berries home in these. Pick blueberries and blackberries separately, blueberries are $2.75/lb. and blackberries are $3.00 /lb. Cash or check is accepted. There is a porta potty on site and a few coolers filled with ice cold water (ahhhh….). 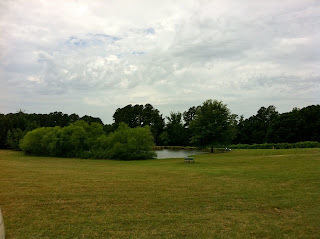 And, if you can't wait to eat the fruits of your labor, they have a few picnic tables overlooking a small lake or bring a blanket and picnic. The berries are not sprayed and looked delicious -- enjoy! Directions: From I-40, take exit 276 (Fayetteville Road) and turn south. Take the first left on Herndon Road. Go 1/2 mile. Turn right on Barbee Road. Go 1/4 mile to farm on right. Looking for a great grilled burger (I'm not talking 24hr drive-thru style here, folks), freshly squeezed lemonade, or a delicious shake? 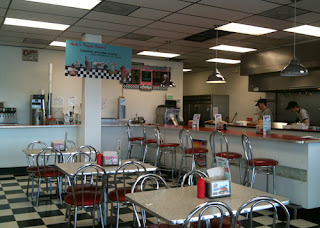 Step a bit back in time and step into the fun 50s style Andy's Burgers, Shakes & Fries. I confess, I like the fun retro decor and that when you arrive, you are not only greeted but the door is opened for you. This is particularly helpful for those of us with arms loaded with kids & diaper bags. Select your seat, get comfy and your waiter or waitress will come to get a drink order. The selection ranges from water and your standard sodas to hand squeezed lemonade & orangeade as well as shakes & floats. What you won't find are beers and the like - unless you count root beer. I personally enjoy their burgers. If it's part of the name, it has to be good, right? There are quite a few other options if that doesn't suit your mood. Cheesesteaks, wings, shrimp - yes, there is quite the variety. And the kids' meals are just plain fun. 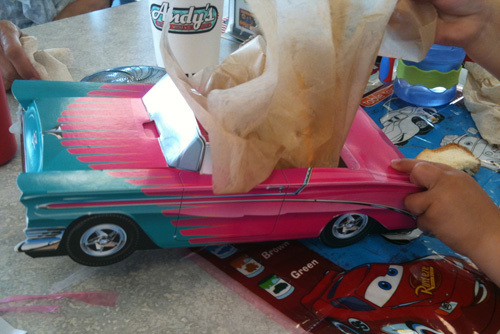 Meals arrive in a "car" and feature fries, drink plus your choice of entree (burger, grilled cheese, hot dog or 4-piece chicken nuggets). D doesn't always eat a full kid's meal so we opted to order just a grilled cheese sandwich for him and share our fries & onion rings. Our waitress was kind enough to still bring his sandwich out in a "car" which resulted in delight from our little one. He couldn't even wait long enough for me to snap a photo before he was pulling out his sandwich to get a better look at the car! Final fun fact about Andy's, it's a North Carolina born company founded in Goldsboro in 1991. Literally the American dream.